Motocross is a loud, dirty, and exciting sport. Sometimes held inside arenas, most often held outdoors on dirt tracks, motocross is never dull. Motocross, or mx, photography is not difficult once you know the tricks but there are specific challenges to photographing motocross. Dirt is the number one issue with motocross photography. Even at indoor arena events dirt is everywhere. Motorcycles kick up dust, mud, and dirt as they tear across the track. Many tracks "prepare" the course by dampening it via sprinkler systems. This only changes the dust to mud until the motorcycles dry out the track as they ride. Dirt, dust, and mud are mortal enemies of cameras. Dirt and dust can enter moving parts of camera lenses and damage optics. It can also lodge on digital sensors. Mud is less often to enter the camera but more likely to be difficult to clean off of the camera and lens. When choosing a location(s) for photography, be aware of where the wind is blowing dust and where riders are throwing mud. You should stay out of the way of the vast majority of the debris. A telephoto lens will help with keeping your camera clean. Dirt, dust, and mud is also vital for your images. 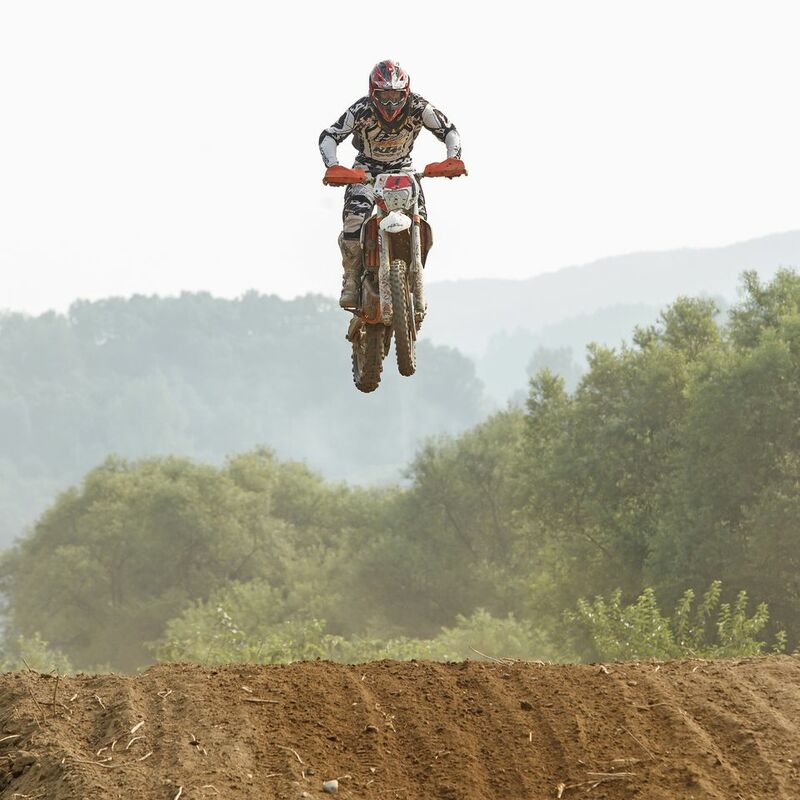 By selecting a composition where dust, dirt, and/or mud is shown flying from behind the motorcycle the photographer increases the idea of motion in the image. If you choose a location where dust, dirt, and/or mud from a previous rider obscures your view of your subject your image will suffer. Very few motocross riders will move slowly. While speeds will vary greatly based on rider skill level, track, and competition level, you can be sure that shutter speeds of at least 1/500 of a second will be required. In many cases 1/1000 of a second or greater is preferred. As we discussed in my action photography lesson, the direction of the motion will greatly change the shutter speed needed. To photograph a rider heading directly at you will require a slower shutter speed than a rider moving perpendicular to you. Backgrounds are a huge obstacle at many motocross tracks. Safety barriers, spectators, and even trees can quickly ruin an otherwise great shot. Scout the track ahead of time if possible. Pick out spots where you can fill the background with the track or sky if at all possible. A jumping rider framed by clouds is greatly preferred to a jumping rider framed by a blue spectator tent. While many photographers use powerful flashes to illuminate rider faces I am strongly opposed to this practice for safety reasons. A flash strong enough to illuminate the rider's face during a race is strong enough to cause light spots in his/her eyes and temporarily decrease their vision. In almost all cases flash is ultimately unnecessary for a good photograph and is certainly never worth risking the lives of the riders and spectators. The vast majority of motocross tracks have multiple spots that are excellent for photography. Scout the track ahead of time and select a location where the sun (or track lighting) is going to be shining on the front of the rider rather than from behind. While you may still need a higher ISO than you would prefer, it is still preferable to causing a safety hazard. Like most sports, there are several "iconic" scenes to a motocross race. These scenes are photographed over and over again because they are the most visually strong scenes. Capturing these poses will help add familiarity to your images as well as the visual impact. Crowded start - the initial crowded start offers a great opportunity to fill your frame with the brightly colored bikes and uniforms of the riders along with plenty of dirt being slung up behind the bikes. Sliding turn - capturing riders as they slide into a deep turn is an excellent way to show off the rider and bike while still showing motion. This is also an excellent image to capture where mud/dirt will be flying away from you. Head-on jump - plan to capture riders as they jump towards you. Make sure you are at a slight angle so that some of the side of the bike will be captured rather than just the rider's head and the handlebars. Crouch down and shoot upwards to increase the dramatic effect of the shot. Side jump - many tracks have at least one spot where riders sail across a fairly severe dip in the track. This is an excellent place to capture the rider in profile during a jump. Be sure to use the fastest shutter speed possible and pan with the motion if you can. Falls - while no one wants anyone to get hurt, falls often produce spectacular photographs.